We lived in Salt Lake City for 6 years in the 90's, and I never tired of the mountain views. Last week, we spent several days there. Steve, our daughter, and our new granddaughter pose in front of the Wasatch Mountains that loom to the east of the city. They're trying out the baby's jogging stroller in a local park. My daughter's two dogs enjoyed going along. The Oquirrh Range runs along the west side of the valley. Of course, the mountains aren't the only attraction. The best view in the Salt Lake valley, to my totally unbiased eyes, is of our little girls. For views of many worlds, far and near, click here. 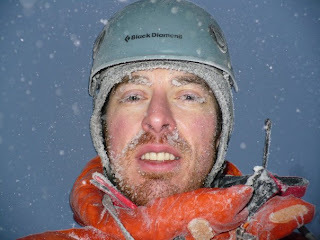 Stones Into Schools begins when Mortenson meets a group of sixteen Kirghiz horsemen who have ridden six days to locate him on the Pakistan side of the Irshad Pass. These men have come from the farthest reaches of the remote Wakhan region of Afghanistan to ask Mortenson to build a school for their children. Mortenson promises, but it takes him 10 years and much help from his native Pakistani and Afghani “dirty dozen” as he calls the brave lieutenants of his non-profit organization, Central Asia Institute (CAI), to achieve that goal. They must travel through areas afflicted by the ravages of 20 years of war, deal with landslides and earthquakes, and build relationships (through many cups of tea) with the local mujahedeen. Along the way, many poor communities request help, which is given where possible. The CAI builds several dozen schools while working toward one of the highest inhabited regions of the world where the Kirghiz horsemen dwell. From the standpoint of overcoming incredible logistics, the CAI’s effort makes a fascinating story. 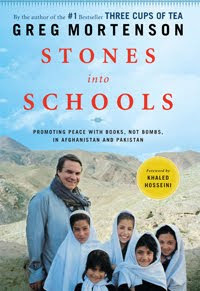 But this is also the touching tale of a people surrounded by Taliban fighters, opium trade, and cruel environmental conditions whose last best hope is that a school will bring a better life to their children and community. Their persistence and eventual success in fulfilling this dream is nothing short of legendary. This is an inspiring book, well written. Read it. P.S. I'm out of town for a few days, playing with my granddaughter. I'll catch up on visiting your blogs when I return! A defiantly dirty Daisy detects an opportunity and, with daring deception, leaps into the truck with a detached deer leg dangling from her dentition. She is proud of this deceit and hopes no one will notice the deed. She discovered the deer part already detached, dead, and demobilized, and is hoping to devour her dainty and delectable discovery. Oh, drat. Her daydream will be dashed, her delusions deflated. Who knew humans did not desire a deer dividend decorating their truck? Yesterday we went to see how our neighbor's calves are coming along. Seven have been born so far. This one wasn't concerned about having company. He didn't bother to get up. This little lady blinked at us with her pretty, long-lashed eyes. This one was a little shy. He hurried to stay close to Mom. I guess he thought the people were too scary. To see what's going on in other worlds, click here. Click to enlarge this photo and you will see a few of the many rabbit trails that make Daisy's nose go into overdrive. For more shadows, click here. I think I smell a rabbit! I do! I do! And I see bunny paw prints! Lots of 'em! There's got to be a rabbit in here somewhere. For more candid shots of cute critters, click here. Our winter days usually start out foggy, with hoarfrost on the trees. snow-covered rocks look like iced layer cake. Distant mountains are a ghostly glow against the clearing sky. As the sun comes out, even the weeds sparkle with their crystalline coating. And Queen Daisy rules the wintry hills. To view myriad skies from all over the world, click here. Yogi at Yogi's Den awarded me the Happiness Blog Award, (Thank you, Yogi! Your blog makes me happy, too!) and before I get distracted (which happens a lot) I'm going to be a good, conscientious blogger lady and pass it on. 1. Steve, my husband of 35 years. He's a wonderful companion, father, grandfather, and partner in crime - I mean, adventure - on the trail and in life. 2. Our 3 children, all of whom are constantly surprising us with how smart and good-looking they are. 3. Our 4 grandchildren. Smart, good-looking, highly gifted (no bias here, I swear) and lots of fun. 4. Extended family: son-in-law, daughter-in-law, brothers, sisters, brothers-in-law, sisters-in-law, moms, dads. We're blessed. 5. Friends and neighbors. In the last year, bloggers have become friends, too, and I welcome and very much enjoy that addition to my life. 6. Our critters: Daisy, Mischief, Boss, and animals in general. 8. Cross country skiing or hiking, depending on the season. 9. The great outdoors: mountains, deserts, forests, etc. I love it all. 10. Reading, writing, and photography. Okay, I don't think anyone was shocked or even mildly surprised by the above list. Creative Chaos Cynthia, a fellow Utahn, is a naturally funny lady. I love her humor and her honesty. The White House There's always something interesting happening at Gayle's house, what with all the kids and pets and Alaska weather. The Road Goes Ever On Kaye is a fellow Utahn, takes great photos, and loves writing, reading, and word games. Ishtar News Esther shares life in Niger, including horsebackriding, ridgeback raising, and her work to make life better for the people of Niger. Memorable Meanders Jo lives in South Africa but is currently in Khartoum. Visiting her blog is an international experience. Joyful Reflections Betsy takes beautiful bird and waterfall photos, and shares her interesting travels. Senior Hiker Photos George shares flower photos, lovely waterfalls, and sometimes a bit of history from his travels. Geogypsy Gaelyn leads an exciting life as a summer park ranger and summer traveler, and she shares her great photos and numerous adventures with her readers. Many Rivers to Cross Mountain Mama is another Utahn. Beautiful photography, deep thoughts. What's not to like? Small Reflections Visit here for lovely mosaics and other interesting presentations of photos on a variety of subjects, a visual feast. To the recipients: Feel free to post the logo and pass on the award. Or not. I attach no expectations or demands. A compass is a convenient contraption to keep a person on track. Comprehending the coordinates is a chore for a child, but not so complicated for an adult. A GPS has a built-in compass, but batteries can conk out, or electronics can crash. A cairn could conduct a canny boy scout under clear conditions, but in inclement weather, when landmarks are disguised by dense clouds, compass coordinates can set the course. A simple compass and map consign comfort and direction to any lost traveler. Certainly, no kid's knapsack is complete without a compass. 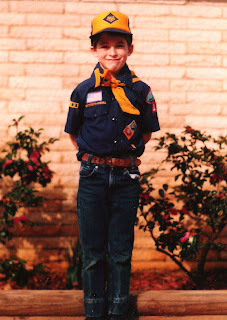 Happy birthday to Eric, once a cute cub scout and now a cool compass, computer code, and mountain climbing guru. 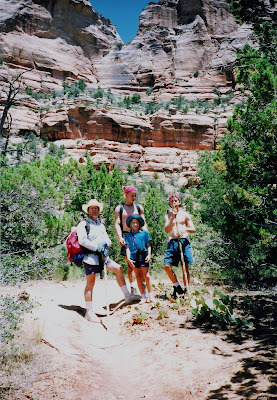 Our first adventure in Utah's Zion National Park was in 1992. We began at Left Fork trailhead. 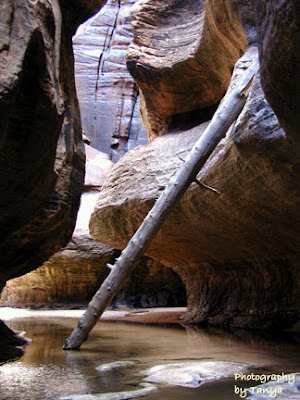 The trail descends into a canyon and continues alongside, sometimes in, the left fork of North Creek. 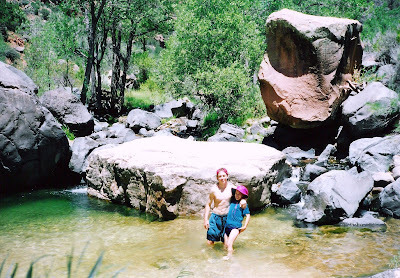 We hiked in June, when the weather was hot enough to make wading, even in the icy stream, comfortable. 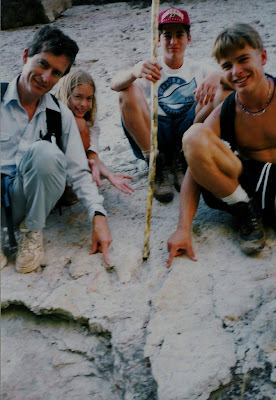 Our hiking guide book told us to look for dinosaur tracks, and we were pleased to find them on a tilted slab of gray mudstone, part of a fossilized lakebed from the Kayenta Formation. 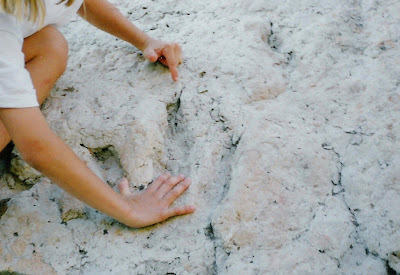 Note the three toes (my daughter is pointing to the center toe, with her right hand in the main part of the track. 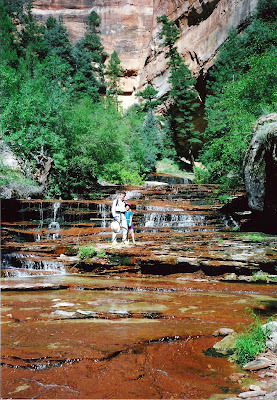 We walked over these slippery cascades. 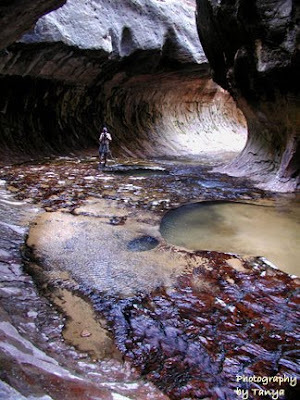 Strangely enough, I can't find any photos of the Subway itself, so I'm sharing some from Zion National Park's website. The above photo may explain why the area is called "the Subway."